Families come in all shapes and sizes, and family vacations should too. 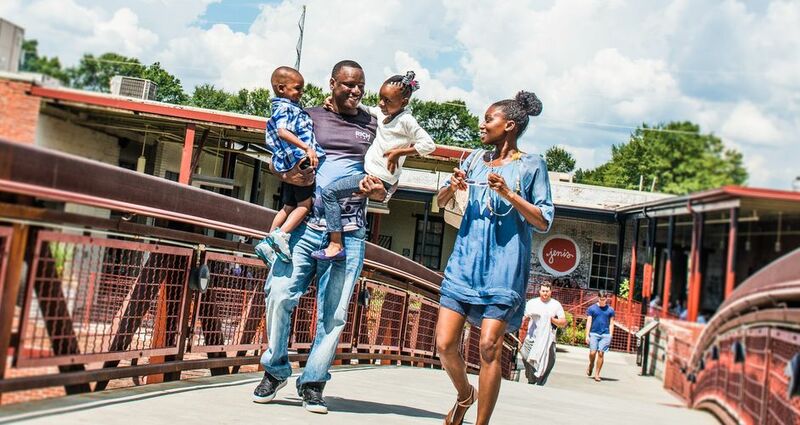 Whether grandma and grandpa are coming along or it’s just you and the little ones, Atlanta has an itinerary for your modern family vacation. Adventure-seeking kids: Check out the newest exhibit at Zoo Atlanta - The Scaly, Slimy Spectacular Amphibian Experience. The exhibit houses more than 60 animal species, including rare Cuban crocodiles. Put yourself in the helmet of your favorite college football team at the College Football Hall of Fame. Using visitor-specific data, each exhibit is catered to the visitor’s favorite team. The LEGOLAND® Discovery Center has more than 15 activities for families to build, play, ride and explore together. Build and test your very own LEGO Racers or climb aboard the Kingdom Quest Laser Ride. Multigenerational History Buffs: When traveling with mom, dad, grandparents and the kids, there are so many people to please. The Atlanta History Center mixes history and fun together through interactive exhibits and living history interpreters. Experience the American civil rights movement firsthand at the new interactive Center for Civil and Human Rights. The Center’s theatrical and high-tech exhibits use motion, sights and sounds to immerse visitors in the American civil rights movement and current human rights issues. Take a behind-the-scenes tour of the fabulous Fox Theatre to learn about the history and a few mysteries of the famous Atlanta landmark. Pop Culture-Loving Tweens and Teens: Keep your tweens and teens engaged on vacation with highflying thrills at Six Flags Over Georgia. Ride the all-new Joker Chaos Coaster or the classic Georgia Scorcher. Let them visit the sites of their favorite movies along the Atlanta Movie Tours. Take the Victory Tour and step into the world of The Hunger Games: Catching Fire and Mocking Jay Part 1. Take in the Atlanta skyline from 20 stories above the city on the SkyView Ferris wheel. Teens will love riding in style in the VIP gondolas, with Ferrari leather seats, glass floors and a longer flight time. The Littlest City Explorers: Keep the little ones enthralled with hands-on experiences. Visit the Georgia Aquarium to see the AT&T Dolphin Tales show, a first-of-its-kind production that incorporates the beauty and agility of dolphins, live human actors, dramatic costuming and amazing effects. Pull strings at the Center for Puppetry Arts, the nation’s largest organization dedicated to the art form of puppetry. Watch a performance from the in-house puppeteers and take a puppet making class afterward. Grab an adventure pass at Stone Mountain Park to gain access to all 10 of the park’s attractions as well as seasonal events. After a day full of fun, finish the evening with the Lasershow Spectacular.